Our healthy eating guide offers easy healthy breakfast, lunch and dinner recipes to help you make your chicken, beef, salmon, muffins, homemade soups, and side dishes healthier and more kid friendly to get your family on the track to great well-being. No matter what kind of parent you are – stay-at-home or working, chances are you’re really busy. Perhaps you wish you had just a bit more knowledge on how to provide your family with a quick and easy nutritious meal. As a busy mom myself, I’m going to give you simple, easy to understand healthy eating guidelines. In no time at all, you and your family will form healthy eating habits and enjoy the wonderful benefits of good healthy food. You can learn about amazing everyday super foods and heart healthy foods, the positive effects of omega fatty acids and the negative effects of artificial sweeteners, trans fats and caffeine to name just a few examples. I’ll give you some mouth-watering recipes using store-cupboard ingredients that you can make really quickly and easily – even if you’re not the world’s greatest cook. There are some delicious, quick dinner recipes for kids that will even tempt the picky eater in your family. To wet your appetite even further, check out the deliciously nutritious soup and muffin recipes. If you are looking for some great dinner recipes, you'll love these easy fast dinner recipes and best ground beef recipes. When we understand what a balanced diet really is, we’ll be able to make those great healthy food choices our family will love us for. Also, check out our related site Wellness With Natural Health Supplements for more information on the 10 healthiest foods, lowering cholesterol and blood pressure, the best mulit vitamins and much more to ensure your family is receiving all the nutrition they deserve! Free healthy recipes - quick to make, great to eat - makes healthy eating easy! 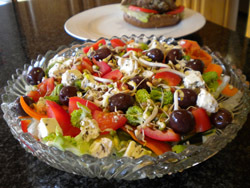 The Healty Eating Blog keeps you up to date with all the additions and changes to the healthy-family-eating.com website. To be kept in the loop, please subscribe here. Ever wonder what a healthy diet really is? Here are some healthy eating guidelines and healthy eating tips to help your family form healthy eating habits and get all the benefits of good nutrition. It is really amazing what a huge impact the foods we eat have on our health. Here are some interesting nutrition facts you just can’t live without. Super foods that have super powers. Here is a list of foods you can easily find in your local store and enjoy every day. Learn about some interesting effects of caffeine, caffeine withdrawal symptoms, caffeine side effects and a few interesting facts about caffeine. Here is a list of everyday heart healthy foods that are really good for your heart, helping to prevent heart disease and lowering bad cholesterol levels. Learning to lower blood pressure naturally can help you achieve your ideal blood pressure - Find out how here! Here are some yummy quick dinner recipes for kids. If you are looking for a simple dinner recipe, these easy dinner recipes for kids are tasty and healthy too. Healthy, Easy Fast Dinner Recipes. Looking for easy fast dinner recipes? My free collection of wonderfully healthy quick dinner recipes can help you get dinner on the table in a hurry! Here are some incredibly delicious homemade soup recipes you simply have to try. There are so many healthy soup recipes to choose from. Seeking a Healthy Muffin Recipe? Healthy Quick Easy Chicken Recipes the Whole Family Will Love! Check out these quick easy chicken recipes that are healthy and easy to prepare! Here is a delicious and nutritious selection of my best ground beef recipes. Your whole family will love these easy recipes for ground beef. Healthy and great salmon recipes ... delicious baked salmon, flavorful gilled salmon, salmon patties and more! A delicious collection of healthy potato recipes - delicious and nutritious for the whole family! Learn how to bake a potato for a quick healthy side dish or a whole meal! Find out about me and how Site Build It! can help you become a work at home mom and open up a whole world of opportunities for you and your family. Tell us your stories about healthy food memories and eating right. Why not share your favouritehealthy recipe with us. If you would like to brag, rant or rave, then this is the place to do it!